Ireland Inc supports Irish brands and Irish identity, culture and innovation: Showing us your true colours Mary? 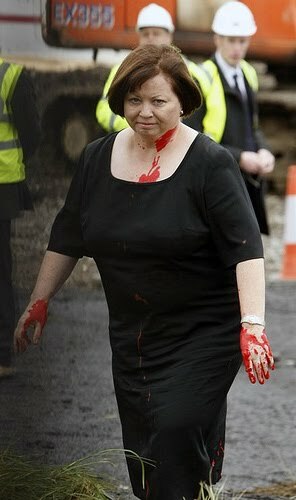 Tempers flared at a recent launch in West Dublin with Minister Mary Harney being doused in red paint. Was this angry retaliation against impending health cuts justified or was it a step too far? Health cuts of up to one billion euro are expected in the next budget only weeks away, is our current government destroying brand Ireland and all that it once was ? Is it time to start to rebuild, starting with these failing droons in Dáil Éireann?